(StatePoint) The holiday season can mean new routines, new décor and new foods in your home. While these temporary changes can be exciting for people, they can be hazardous to pets. “The extended holiday season is no excuse to take a vacation from being a great pet parent,” says Dr. Jeff Werber, Hollywood’s Vet to the Stars. Keeping your dog happy and healthy this holiday season is easy, Werber says. He is sharing some seasonal tips. • Keep curious pets focused: Most pets will be curious about the tinsel, ornaments and ribbons of the season. Since most decorations are not pet-friendly, keep them beyond reach and take necessary precautions and keep your pets focused on something they truly enjoy. If your dog begs at the table every night, chances are they’ll be begging at the holiday dinner table. With new people over and different kinds of food falling to the floor, it’ll be important to prevent distractions during dinner. Use healthy treats, such as Greenies, as a training tool to keep your dog away from guests’ dinner plates. • Give recognizable gifts: A whopping 85 percent of pet parents buy their dog a holiday present, according to the 2014 Greenies: Dog Owners Survey. In order for your pet to be as thrilled about their stocking as you are, give them the same treat before the holiday — so that it’s more familiar and better received. This year, consider giving a gift that promotes good health. While nearly half of all dog owners have turned away from a kiss from a dog because of its bad breath, more than a quarter say they don’t brush their dog’s teeth at all. And bad breath isn’t just unpleasant; it can be a sign of poor dental health or dental disease. Consider giving your dog a dental chew that carries the Veterinary Oral Health Council Seal of Acceptance for control of plaque and tartar, such as Greenies Canine Dental Chews. 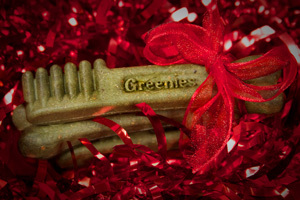 They are the number one veterinarian-recommended dental chews and are available in special Season’s Greenies holiday packaging around this time of year. • Give your pet extra love: During the holidays your routine will likely change. Your dog will be able to tell, but not know why. As you are out shopping or attending a holiday party, your pet might be missing out on his usual attention. Show your pet some love by setting some time aside for daily play time or an extra walk. Or give them their favorite treat. More pet health tips and resources can be found at http://www.Greenies.com. The holidays are all about sharing time with friends and family. In the shuffle, don’t forget your beloved pet!